One day later, news outlets swooned over hints that the White House is prepared to take more direct steps to curb two investigations into Russian election interference that include contacts inside the Trump presidential campaign, one by the Senate and another by the FBI. These reports are compelling to those following the Nixonian narrative, but a look behind the curtain reveals mostly bricks at this point. In drawing this conclusion, Think Progress relies on an MSNBC interview with Principal Deputy White House Press Secretary Sarah Huckabee Sanders. The deputy press secretary's statement is a fairly boilerplate denial for any entity that is publicly under federal investigation. Public relations professionals often issue denials in such circumstances. Some denials are vindicated, others not. 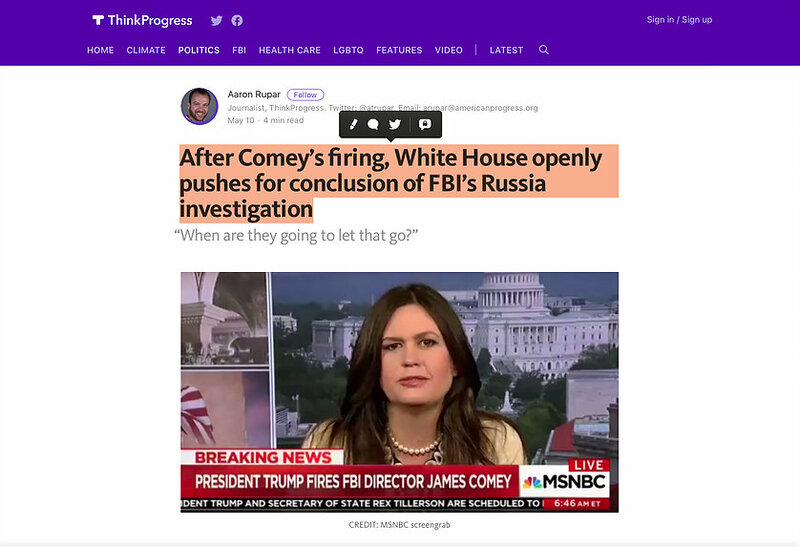 A reciprocal search of Think Progress' claims returns little in the way of evidence that the White House is pressing to cease the investigation in any official capacity, despite plenty of questions and speculation circling Trump's decision to can Comey in the middle of a high-profile investigation that is targeting his presidential campaign. On the contrary, the reciprocal search results above show that rhetoric on Pennsylvania Avenue is unchanged since a round of news reports about a house investigation at the end of March. Ironic. Traffic-driven partisan news sites have plenty of incentive to build a story that appears to advance a narrative of impingement on the part of Trump on investigators. The evidence used to substantiate these headlines is thin to nil, however. A similar headline, published on AOL News, references nothing more than Huckabee Sanders' same MSNBC interview. There is, as expected, plenty of other misinformation swirling around Comey's ouster. White House officials, including Hucakbee Sanders, continue to boast that Trump and his associates have been exonerated from the FBI's investigation. The only sources of such claims originate within the White House. There have been no verifiable claims by officials with the FBI or Senate that specifically exclude anyone from either the FBI or Senate investigation. Harvard Law Professor Laurence Tribe told the same Associated Press reporter that such a conversation "would have violated well-establiched DOJ rules and policies for the director to offer any such assurance to anyone, especially the president." As a former court reporter who spoke with contacts at the justice department, I have encountered this policy first hand when attempting to uncover investigations into local political officials under investigation.